The Trust Technique is based on the theory that deepening the connection between humans and animals can transform the lives of both. It uses mindfulness and focused presence techniques as a basis for resolving problems for humans and for pets or other animals. Daily practice of the Trust Technique creates a shared peace of mind and reduces anxious over-thinking—one of the main causes for so-called “behavioural problems” in pets and humans. This dynamic approach does not objectify animals, but rather recognises all animals as sentient equals and transcends an unhealthy approach of dominance or control. Humans and other animals work in trusted cooperation, which leads to more truthful communication and manifests in shared well-being. Have the tools to help you and your animals define new levels of cooperation. We were first invited to teach at Omega back in 2016 and have been returning every year since then. Omega is a very special place with wonderful people who we are proud to call friends. Omega has a purposeful intent to awaken the best in the human spirit. With a wide variety of workshops that promote personal growth and social change. 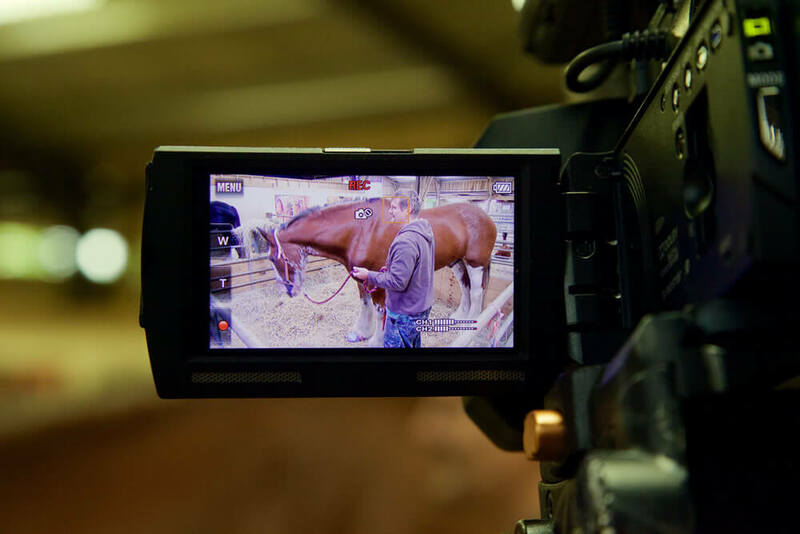 The Trust Technique five-day experience is the first full animal workshop run at Omega. Recognising the importance of the animal-human connection in both personal and sociological change. The purpose of both organisations combines beautifully as we explore and bridge the connection between people and animals with regard and kindness. Founded in the 1980s on the belief that all individuals deserve equality, compassion, and justice, Animal Farm Foundation (AFF) brings dogs and people together to end discrimination. Founded in 2008 by Deanna Mancuso. 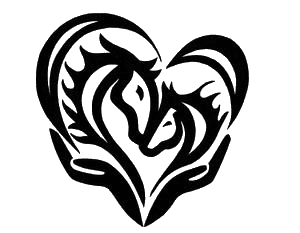 Lucky Orphans Horse Rescue is dedicated to providing a sanctuary for unwanted, abused, neglected horses and to improve the relationship between horses and people. They have wonderful programs helping horses and people through education and therapy. 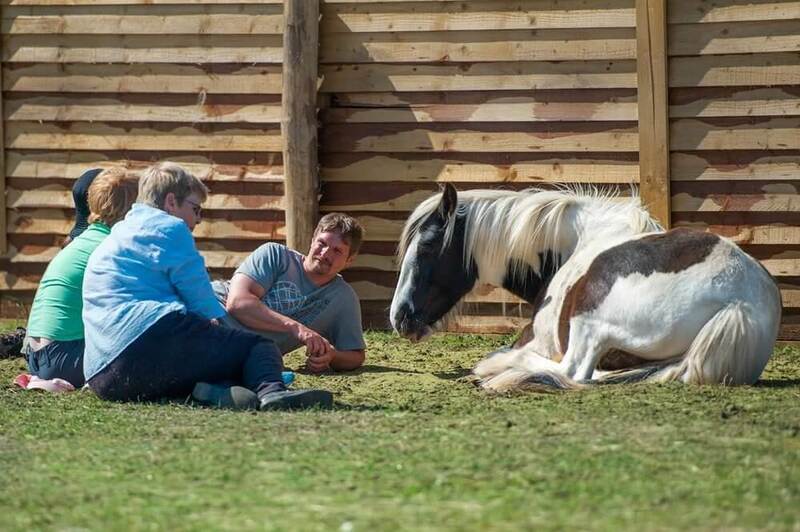 It’s a real joy to spend time with the horses, hear the success stories of people helping horses to heal people. Participants learn how to reduce an animal’s thinking levels, creating an intimate and powerful state of confidence and trust. This stage is integral to the relationship between an animal and a human. This sharing does not just help the animal it also helps the human discover their own authentic connection. Over the five days, we will be exploring Creative Reaction for both animals and people. How this one concept can have a dramatic effect on changing the lives of both. The hands-on experience integrated into the course was invaluable. Working with Dogs, sheep and horses brought the principles of the Trust Technique alive. The Trust Technique has a very powerful way to teach animals confidence with self-learning. This simply profound approach greatly increases learning retention and changes the “animal training” dynamics. To help animals we also need to be able to help people as well, Realisation Learning is a shared event! 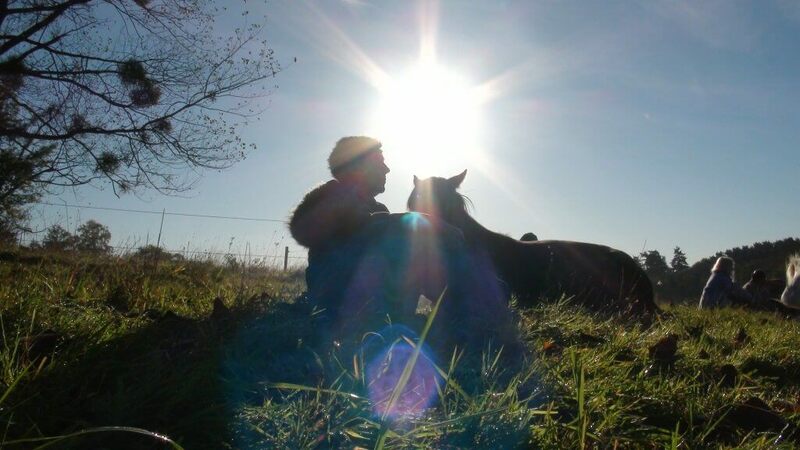 James discusses the amazing connection that people and animals share, how this deeper connection can be used in therapeutic practice and shares this unique way that people can let go of their own past and create a peaceful future. James and Shelley educate with a deep reverence for for the material as well as for the students. 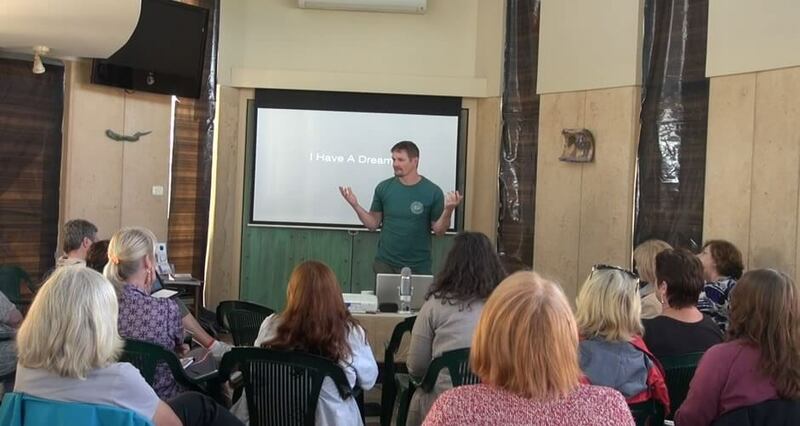 A life changing experience that anyone at any age could benefit from…. this is the future of communicating with all life. When two minds are peaceful an intuitive gateway is shared. This is the door to discovering and sharing pure animal intelligence and is a unique and dynamic way to help develop trusted cooperation. It will also enable you to take your animal training to a new and exciting level. With this skill set, the sky is the limit on what you can achieve together. Throughout the five days, we will also be sharing how you can work with Trusted Cooperation within yourself. Allowing you to swim with the current of life rather than battling your way upstream! 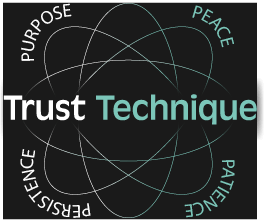 I came to the Trust Technique program last year and loved it. This year it was even better! How could that be possible? It simply was. James and Shelley are engaging, sensitive and encouraging leaders. They always had time to help the participants understand the concepts more fully with plenty of time to practice. Thank you Omega for bringing them back. This program effected me profoundly in ways I am still processing . I have noticed a more peaceful response to situations that before would have me in a tailspin , In addition ,the trust formula is miraculous in relationship to the animals, Man bond and healing for the animals and ourselves. This is not theory but my experience there with animals and with my own learning of how to heal deep core issues within myself. I cannot say enough about the value of this work personally and for our world and all its creatures..a quantum leap for trust and peace in a weary world…thank you!!!! Dates don’t work for you! Thank you Shelley and James. You both are gifted teachers and have the most comprehensive and gentle way of guiding your students. You led us on a journey of peacefulness and showed us how we too can find our way by practicing the Present Moment. Quiet, calm, and peace are transformative for all of us, people, animals, the planet. Thank you for another heartfelt Trust Technique experience. I am beyond grateful for the 5 day experience with James and Shelly and the Trust Technique. To say it far exceeded my expectations would be an understatement . It fullled a deep and lifelong yearning for aminals to be seen and respected for the sensitive and intellegent beings they are. There were many times during that week that we learned to "Be" with different species of animals which created a deep bond of mutual respect and healing ( Mindful Regard, as James teaches and demonstrates). There were many moments I sensed wonder and awe with my classmates and myself and the animals responded in gracious presence and curiousity . There are no words for the sacredness of such moments. To be fully present and available ,,,nose to nose, eye to eye and heart to heart with a sheep was an unforgetable instant of oneness of spirit. Personally , in practicing through exercises and experiencing the present moment often during the week, I released a core tramatic issue that had been overshadowing much of my life. it wasn't until I returned home that I realized the full impact of that. The peace that is feel as a result is profound and grounding . I have let go of some heavy baggage and now, experiencially understand the difference between being brave and being at peace... (Thank you James.) and that is what the animals are left with too!! I intend to continue with this inspired work and am deeply grateful to have, no, -to "BE "in a way to support others,especially the amimals to find and trust in the peace they deserve. Forever grateful to be a part of this "wave" of kindness...if you feel a stirring in your heart to learn more... Just do it!! Guiding me to this oath of trust and peace. Teaching and on site workshops too! In making the works a better place.